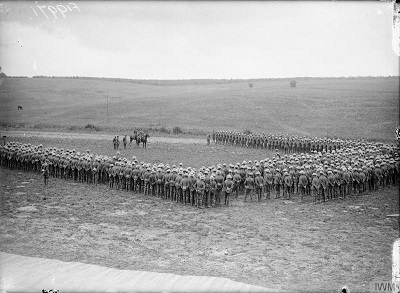 The massed ranks of the 1st Battalion, Lancashire Fusiliers being addressed by their divisional commander, Major General Henry de Beauvoir de Lisle at Mailly Maillet before the Battle of the Somme, 29 June 1916. 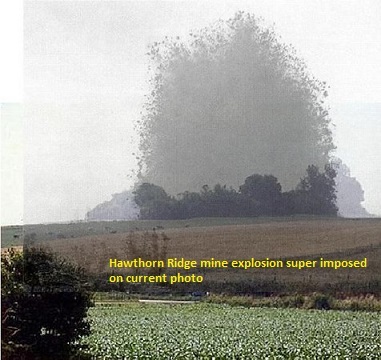 Hawthorn Ridge Redoubt mine was blown at 7.20 am, ten minutes before the men went 'over the top'. This gave the Germans ample time to occupy the crater rim with machine guns to repel the attack they knew was imminent. Firing the mine so early before the attack is acknowledged as a massive blunder. After 100 years unexploded shells are still being harvested.This shell has recently been found and placed by the side of the path leading up to the crater for collection. A short drive up to the Accrington Pals site. British attacks on the Somme had brought the front line close to the village of Pozières. There, in darkness on 23 July, the 1st Australian Division made an assault supported by heavy artillery fire. The ruined village was taken in hard and intense fighting and enemy counter-attacks were repelled. The Germans responded by pounding the area with their artillery. The capture of Pozières was a significant achievement, but within five days the 1st Division had lost 5,000 men. 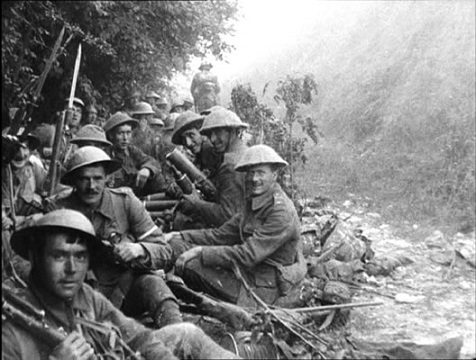 The 1st Division was replaced by the 2nd, whose first attack met with disastrous losses. 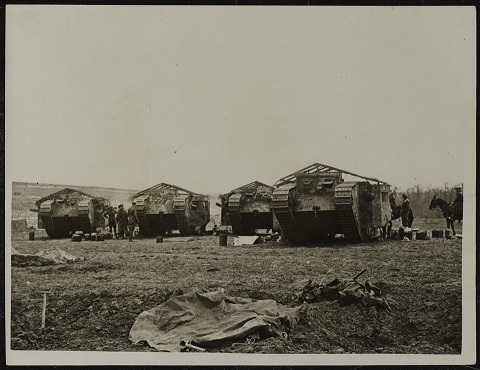 In further fighting the division captured some ground but suffered more casualties – overall, almost 7,000 in twelve days. The 4th Division was the next to take part, pressing its attacks towards the adjoining Mouquet Farm. With this move, the Australians were trying to threaten the enemy positions at Thiepval, where the British had been stuck for weeks. However, in attacking on a narrow front they became increasingly exposed to murderous shell-fire and yet more counter-attacks. The three Australian divisions took their turn at Pozières and all suffered heavily. Then, with their numbers built up to only two-thirds strength, each was sent into the inferno for a second tour. Over a period of 42 days the Australians made 19 attacks, 16 of them at night; as a consequence, the casualties finally totalled a staggering 23,000 men, of whom 6,800 were killed. 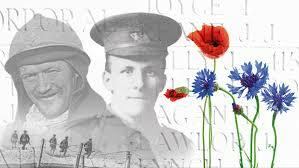 For men thrown into the fighting at Pozières the experience was simply hell. The battlefield had become the focus of artillery fire from both sides. Attacks went in, some ground was taken, and then the enemy would counter-attack. 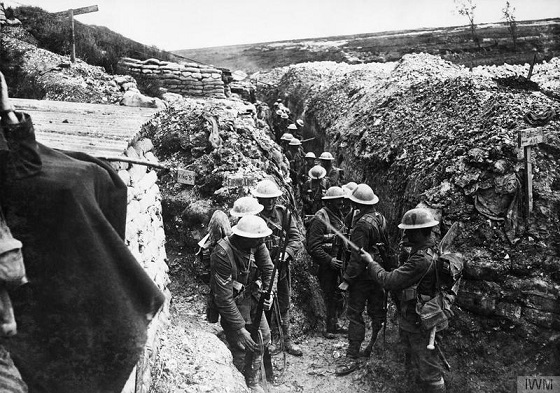 Throughout this action the fighting was wild, and all the time the shelling tore up the ground, folded the trenches in, and blew away any protection. In the fighting at Pozières, around the Windmill and northwards along the ridge towards Mouquet Farm, the AIF suffered more than 23,000 casualties in little more than six weeks, between 23 July and 5 September 1916. 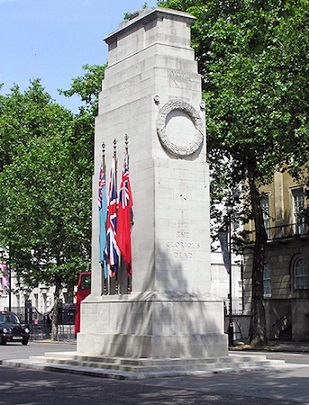 Of these casualties, nearly 7,000 were killed, had died of wounds or were ‘missing’. Visible from the Windmill along the road eastwards towards Bapaume is a tall red marker. It states that here was the front line on 1 September 1916. Just a kilometre or so away across the fields to the north–west lie the modern farm buildings of Mouquet Farm and about a kilometre back down the road through Pozières is the First Division Memorial. Here the eye can take in a small area where, in just over six weeks, 23,000 Australians became casualties of war. If you are interested in the Somme battlefields, a great place to stay is Avril Williams, 'Ocean Villas' Tea rooms and guest house. Situated in Auchonvilliers It is in the heart of the Somme battlefields and just a few minutes away from many interesting sites. 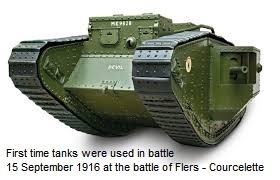 You will meet people there who have an interest in WW1, many of them knowledgeable on the subject and you may also meet one or more military historian who frequently stay or stop by as it is the metropolis of the Somme Battlefields. You will find it 'Home from Home' as you can have a full English breakfast and a nice cup of tea anytime, along with a warm friendly service and a chat. There is also a bespoke conference room for groups and schools and an amazing museum. 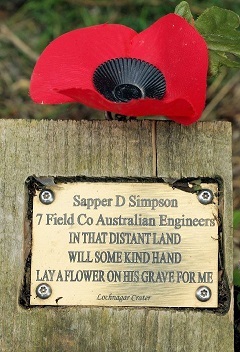 4264/A Spr D. Simpson 7 Field Company Australian Engineers, as most other burials in Heilly Station cemetery, shares a headstone with another of the fallen. He shares a grave with 2636 Pte J. Jackson and I therefore planted two poppy crosses on the grave and photographed the headstone. It does seem that others too, have seen and acknowledged the message. I very much hope that relatives see these pictures and learn of the recent visit. The photo above is of the wooden walk way around Lochnagar crater. Some of the boards have brass plates embedded with names of the fallen. The photo to the right is what Bob posted on his site. On the recce of our trip, I went to acknowledge the request. 20189 Dvr A.Hawkins was the first 7 Field Company man killed in WW1. He shares a grave with two others. The headstone is now quite faded and needs replacing. Dvr Hawkins name in the centre. Dvr Hawkins was injured by shell fire in Ploegsteert and died of his wounds 4 November 1914. His horse was killed outright. Driver Arthur Hawkins is buried in Bailleul military cemetery Belgium.